Dare Davis, one of the four owners of Pier 70 Marina, has been living the past fifteen years of his life not taking risks. 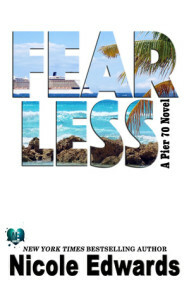 He considers himself fearless because he refuses to let anyone close enough to hurt him. He’s had his heart broken before, he’s not looking for it to happen again. OMG, this book was just as amazing as the first one. You can feel all the emotions as they are playing out in the story. The prologue grabbed my attention and broke my heart, I HAD to keep reading! Dare just makes my heart melt and so many times I wanted to reach through my e-reader and hug him and tell him it would be ok. Noah had to earn my love, I was just so mad at him for hurting Dare all those years ago. When we find out what Noah went through right after things happened in the past my feelings started to change. This was a beautiful story about second chances. We got to see all the characters from the first book too which was great. This book made me laugh and cry and I loved every minute of it. I can’t wait to see whose story is next!